ATLANTA, Feb. 18 /Christian Newswire/ -- As things begin to heat up in a busy legislative session in Georgia, and state lawmakers fight over their own special interests some of these political tensions have clearly lead to the arrest of one demonstrator this week. 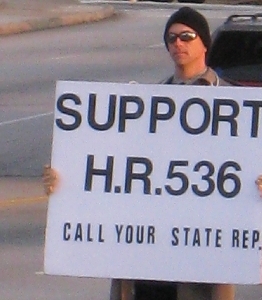 Robert Roethlisberger Jr., of Clarkston, Georgia, was arrested on February 15, 2008, while holding a sign promoting House Resolution 536 known as the "Human Life Amendment." It is an attempt to place on this year's election ballot an amendment to the state Constitution that would protect human life at every stage of development. "Having been arrested for criminal trespass while standing on a street corner can only give you the idea that someone wants your message to disappear," said Roethlisberger. "A 'right to petition' are the last three words written in our first amendment to 'The Bill of Rights' but this right carries little meaning if you get arrested for expressing a need for change in government," says Roethlisberger about his most recent arrest. Roethlisberger continues, "Everyone living in the state of Georgia that believes in life needs to demand from Mr. Speaker Glen Richardson that H.R.536 gets to the floor of the House for a vote and also ask for their own State Assemblyman's support for H.R.536 so that the people of Georgia can have this opportunity to vote for life on their 2008 election ballot."